With well over 100 muffler men out there and being over 50 years old now, chances are high that not all of them still are %100 complete. 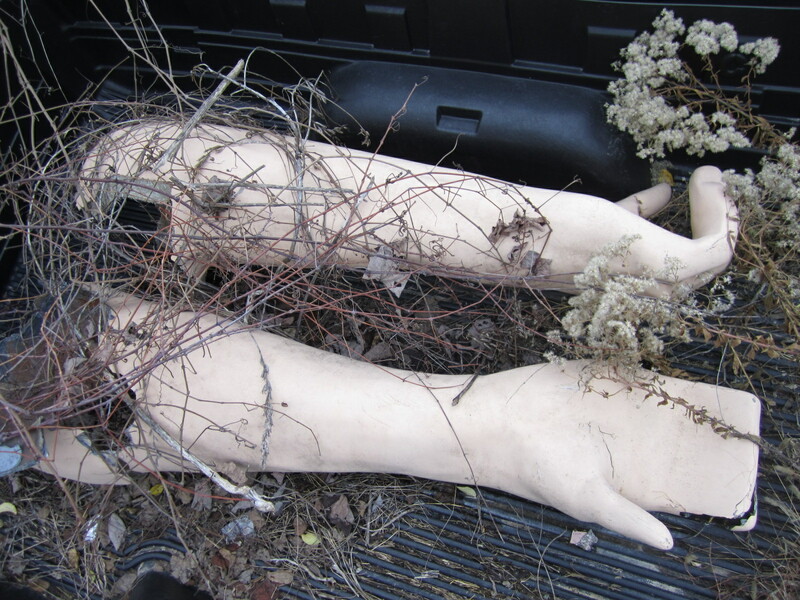 Feet, heads, arms and items they held commonly disappear and even a torso from time to time. 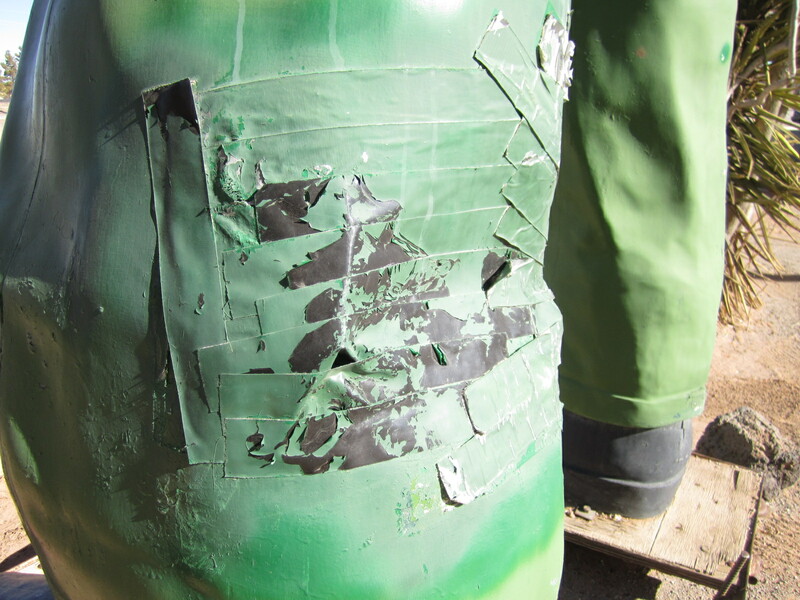 Before International Fiberglass closed it’s doors part of it’s business was simply replacing missing axes and other things the muffler men held. It seems more then one collage student in the 70’s wanted a giant axe for their dorm room wall. Sadly stealing these items came at a price that the owners had to foot and although some ordered new items many didn’t bother and so the majority of muffler men out there today hold nothing at all. 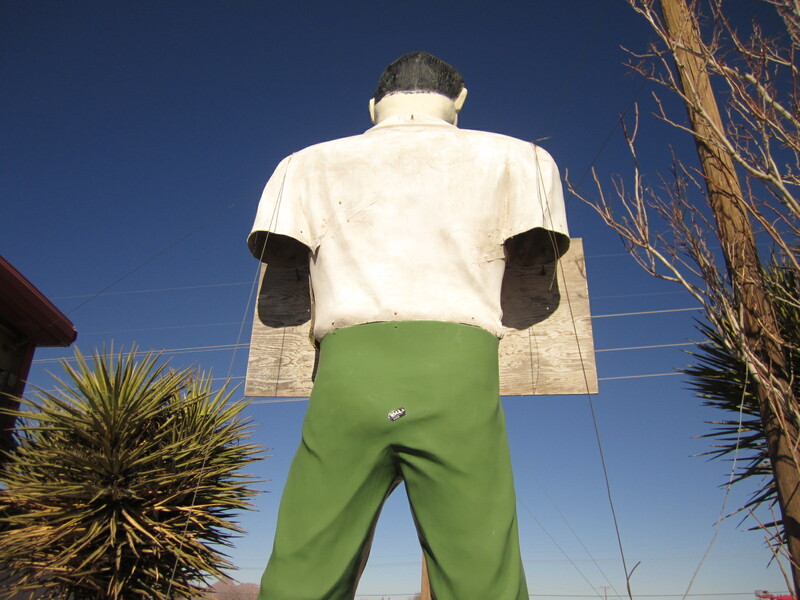 The service man version that stands today in Las Cruces, NM is one of the ones missing some important body parts. 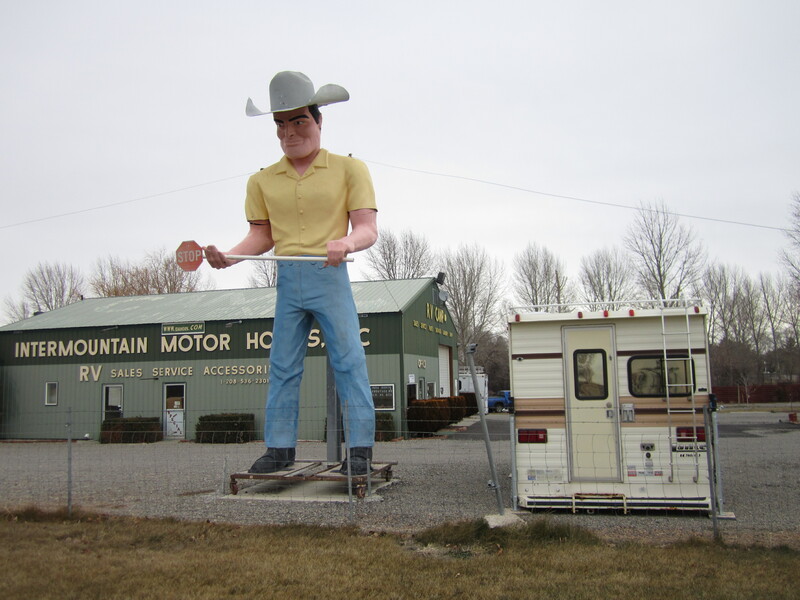 I have always thought that if a muffler man is missing something important, it’s because it was taken or stolen at some point in time but surprisingly this is not always true. In fact it is important not to jump to conclusions because in many cases the owner still has the missing pieces. 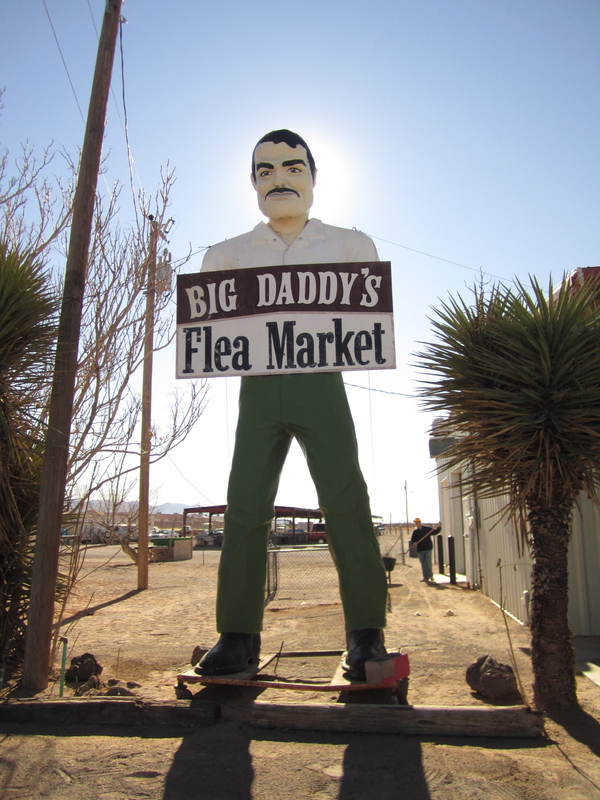 This is the story here in Las Cruces and his arms were simply taken off to accommodate that huge sign he holds and they are stored at another location. 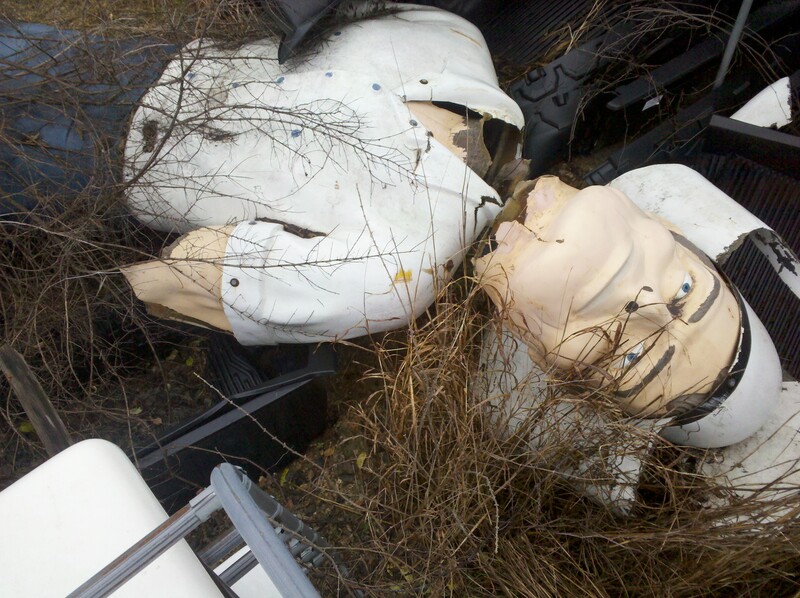 Other muffler men with body parts in storage include the steelers football player in PA who’s head is not missing but in storage after falling off. 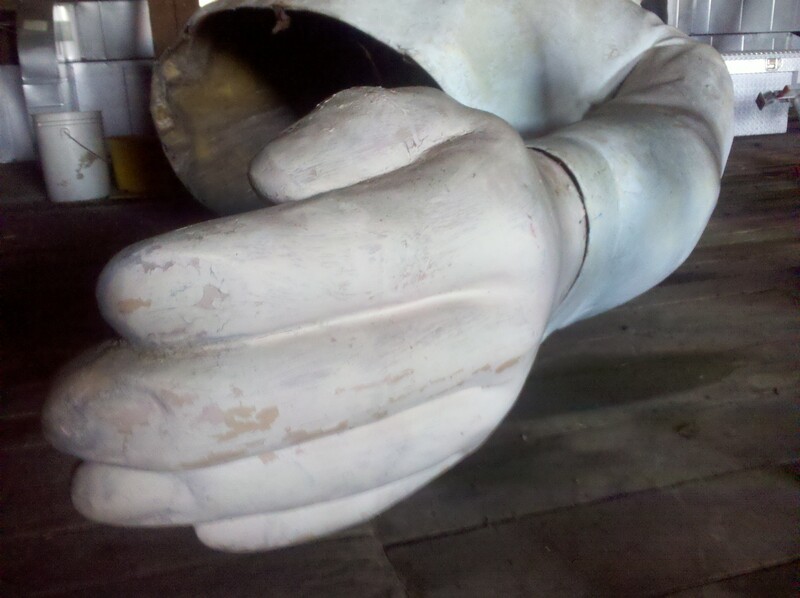 The Bunyan at Lake Vanare, NY is missing a foot that the owners have in storage (although I think one of his arms is gone for good). 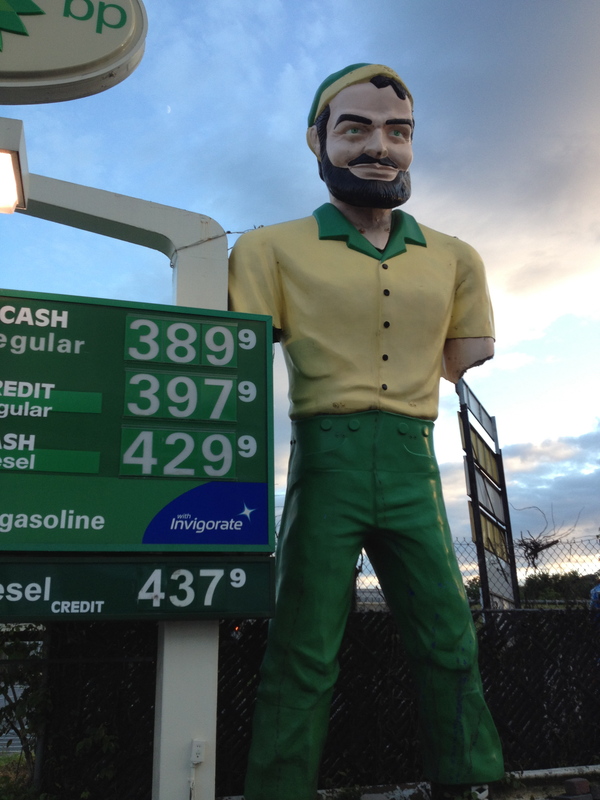 The Elmsford, NY m man was always missing his right arm but the left was knocked off recently when a truck backed into it and it is stored inside the gas station. The Las Cruces m man arrived here in the early 90’s and was hauled in the back of a dump truck in 3 pieces. 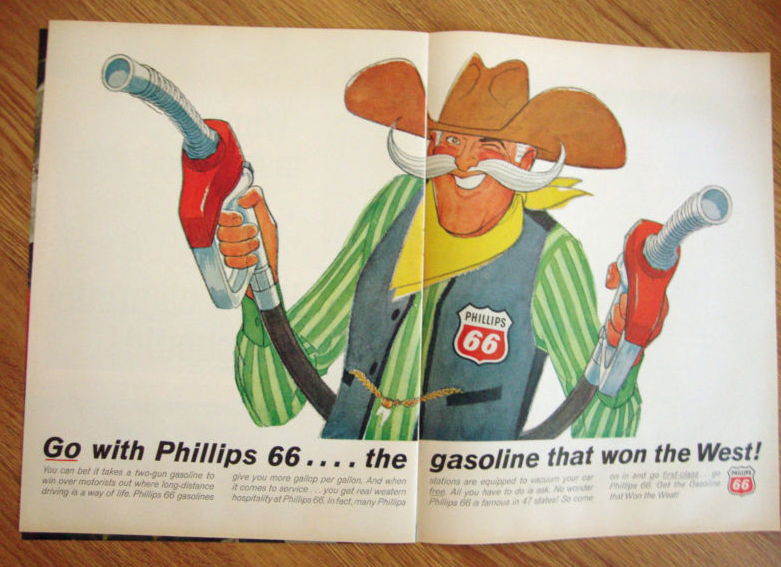 His owner said he was once a Phillips 66 cowboy but had already lost his hat by the time he purchased him. 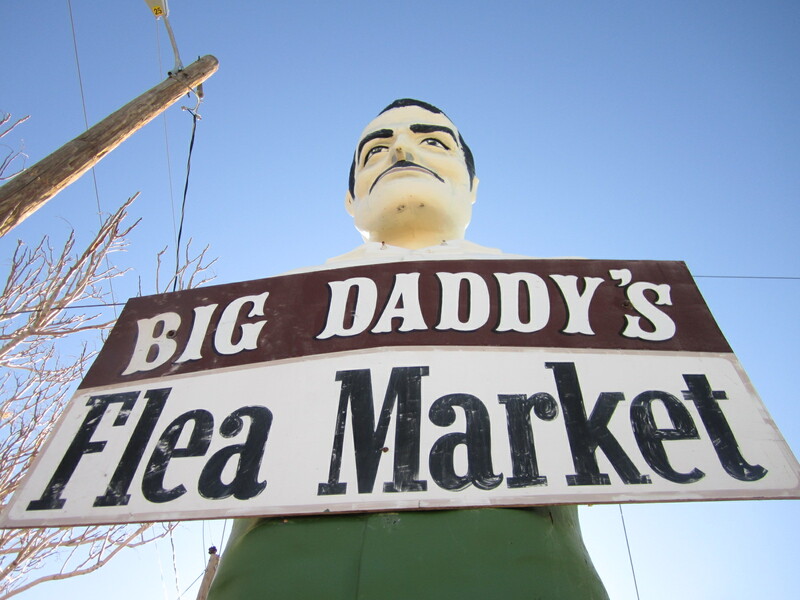 He has stood here at “Big Daddy’s Flea Market” for a long time and the locals all call him “Big Daddy” Since he is a cowboy that almost is a guarantee that he has a International Fiberglass stamp on his leg, although it is faded I could still make it out on his left leg. His right leg is banged up a bit and has been patched with some duck tape thats starting to come off so some fiberglass work on this guy would not be out of order. I was also very interested in the platform that he stood on. 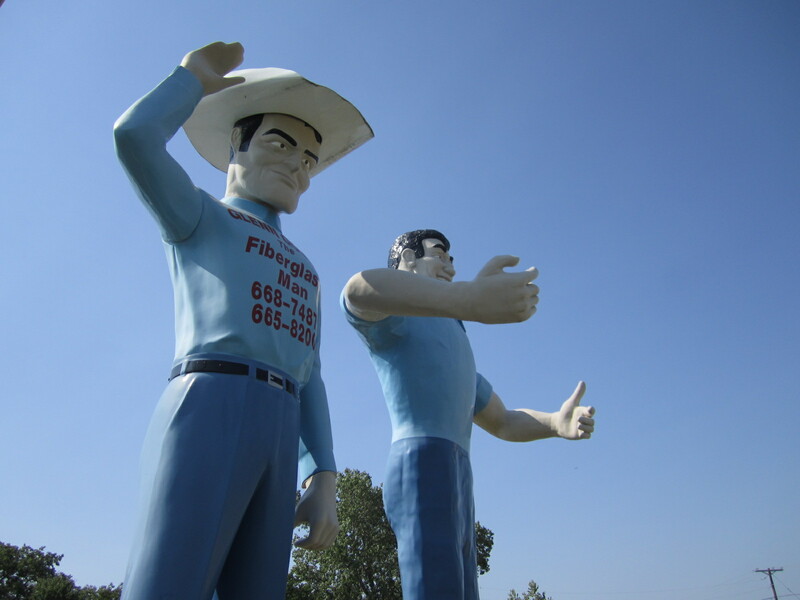 International Fiberglass sold their muffler men with a stand that was a metal frame on wheels. 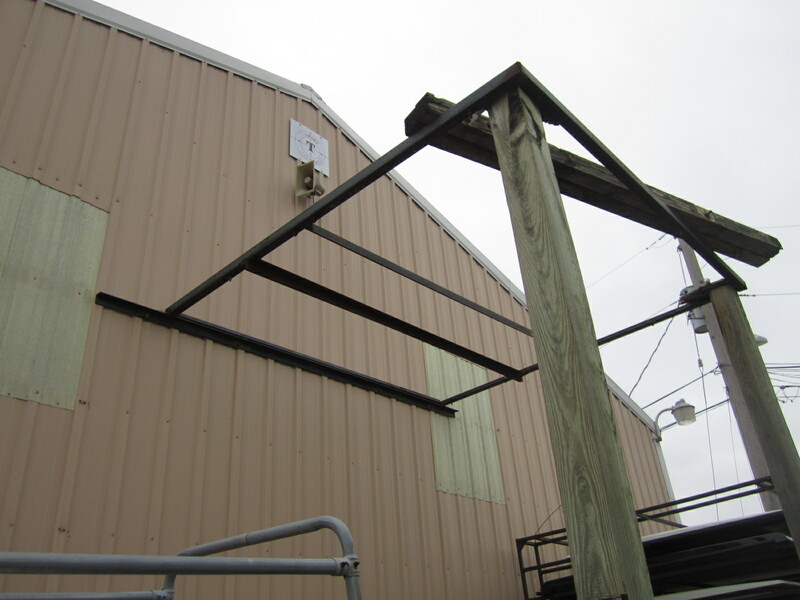 This was a patented design made by Steve Dashew and it was built so the giant could be displayed at a business and also easily hooked up to a trailer to be moved to another location for display. The Texaco Big Friends were all sold with this and I have seen many vintage pictures of muffler men in the 60’s and 70’s standing on these platforms. These days they are almost impossible to find and I have only seen a few of them in my travels. However this giant seems to be standing on one and if it’s not original it still closely resembles what these guys once shipped out with. 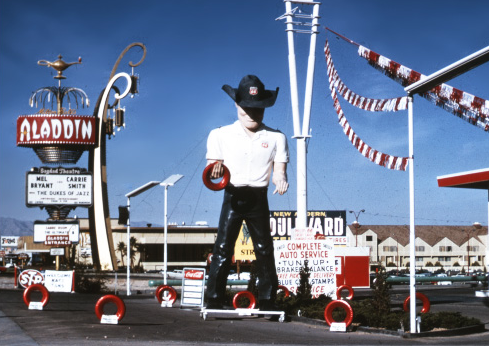 The area seems to attract large objects and there is a giant bull across the parking lot from the muffler man. I wish now I would have asked the owner about the platform but as is often the case I noticed it later when studying the pictures I took more closely. It’s amazing the small details you can miss and look over when on site with these guys and I always seem to discover more at home studying the picture then I do out in the field. 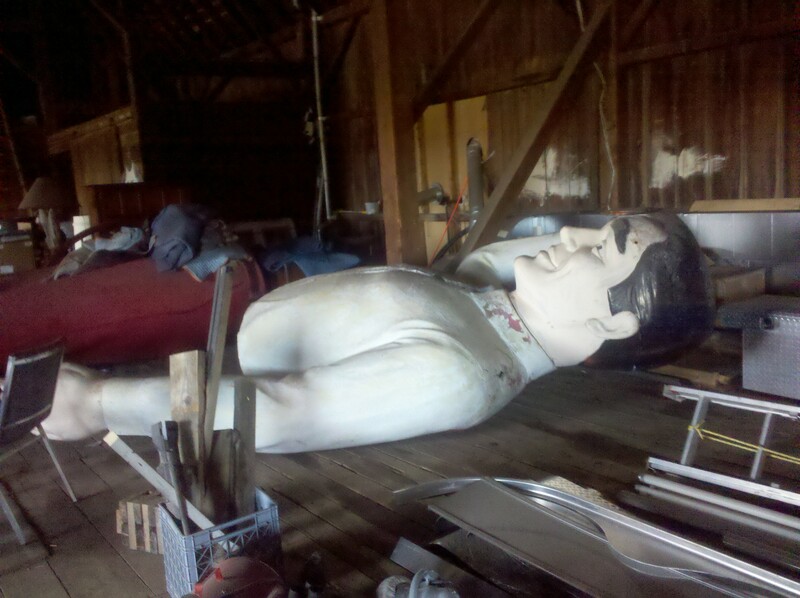 In a lonely field all by himself stands one of Glen Goode’s “copies” at his sons sand blasting business in Sherman. Glen made two more cowboys from the mould he cast (see #13) and one came here and the other one went to Sanger, TX. All three look just the same and have an original muffler man head, hat and hands which were not actually designed to go with this body. 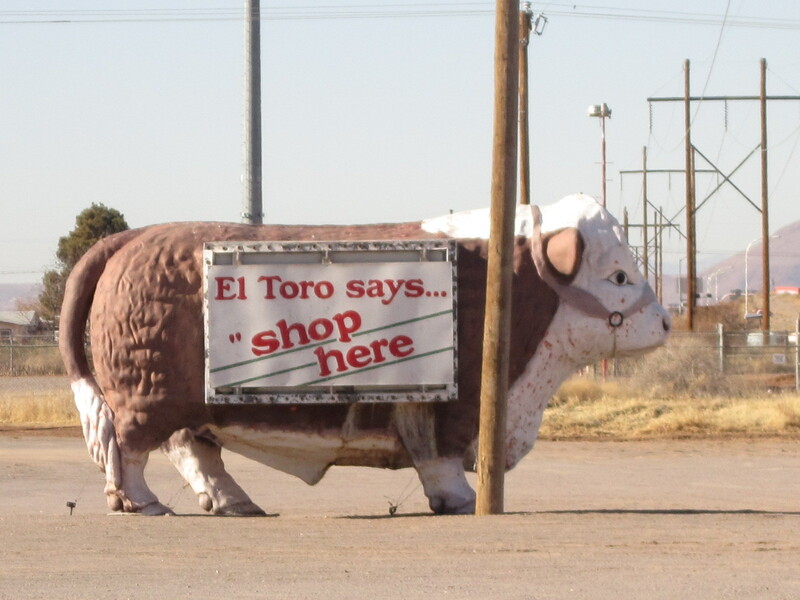 It looks like it has been awhile since this guy got a touch up and paint job and I am not sure how much business goes through this place anymore as it was pretty empty when I stopped in. 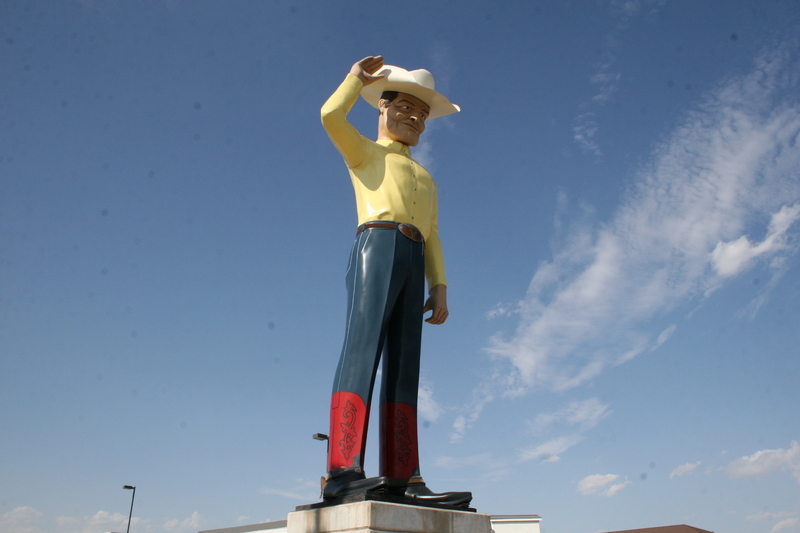 The cowboy in Sanger also stood at one of Glen’s son’s businesses but that one was sold and moved up to Amarillo in early 2004. It now stands in front of the Country Barn Steakhouse right along I-40 and looks in much better shape then it did when in Sanger. Bullet holes have been patched up and a local painter in Amarillo has done an amazing job with this guy. Thanks to my friend Michael Younkin for snapping this picture for me in 2011. My 13th M Man was one of the more famous or well known ones out there. 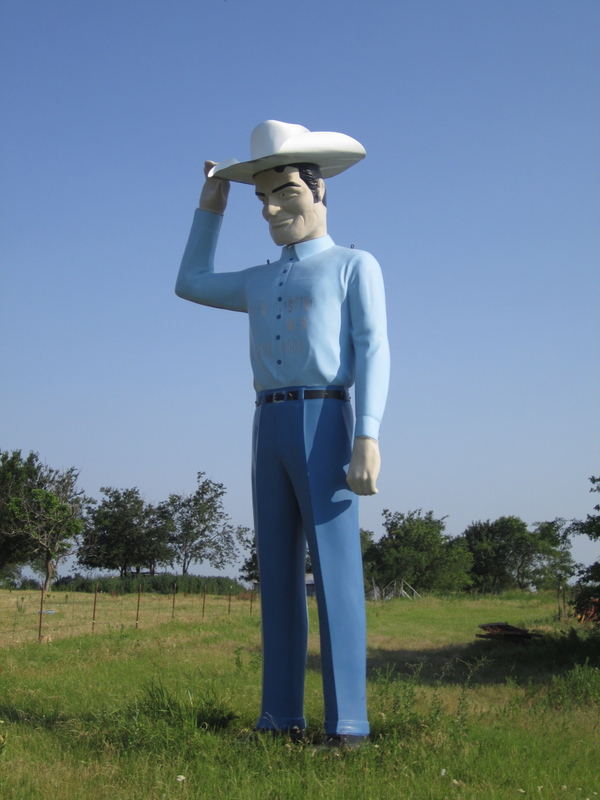 A tall cowboy standing in Gainesville, TX one of 4 giants standing in front of Glen Goode’s farm. Glen’s collection is one of the more photographed and talked about ones so I had heard of Glen long before my visit and it was a pleasure to finally meet him. He loves having visitors and as soon as he saw me out there taking picture he hopped in his golf cart and came right over to tell me about his collection. He’s got 2 Big Johns (not M Men but another bread of big men, I’ll do a blog about them sometime in Feb) a cowboy and a Uniroyal Gal. 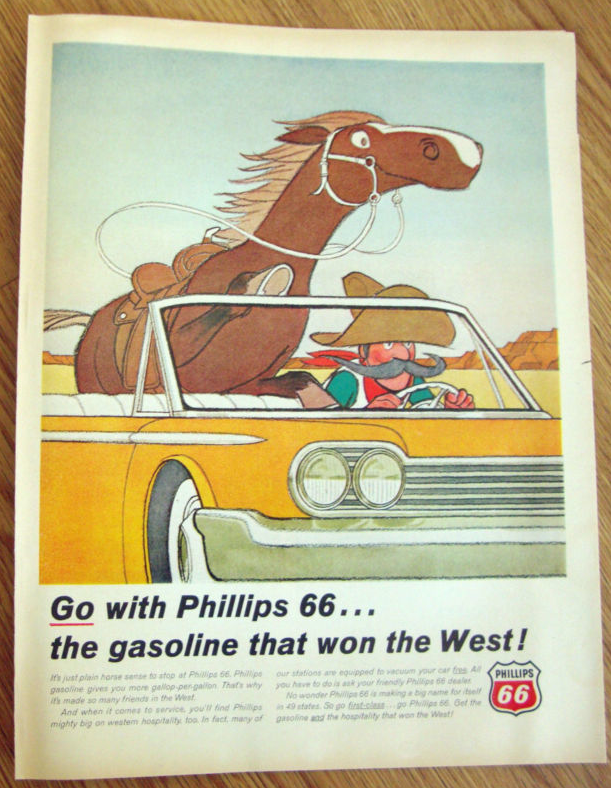 The cowboy is a rare model made by International Fiberglas that has yet to be coined with a name (I call it the “Glen Goode” version) and it often is confused with the Texaco Big Friend which Glen assured me it was not. He told me he had once worked for Texaco and remembers the big friends and that the wind blew a few over and they caused law suits and Texaco ordered them all taken down and destroyed. He alluded to the fact that he had a chance to get his hands on a few but didn’t. 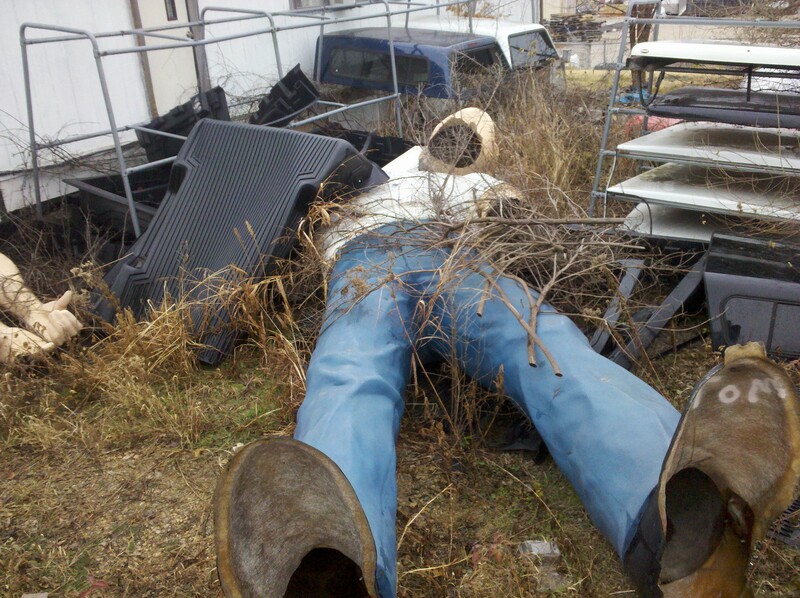 Anyhow years later he spotted this body in Garland, TX at a go cart track laying out back with no head or hands. He bought him and hauled him home to start his collection of giants. 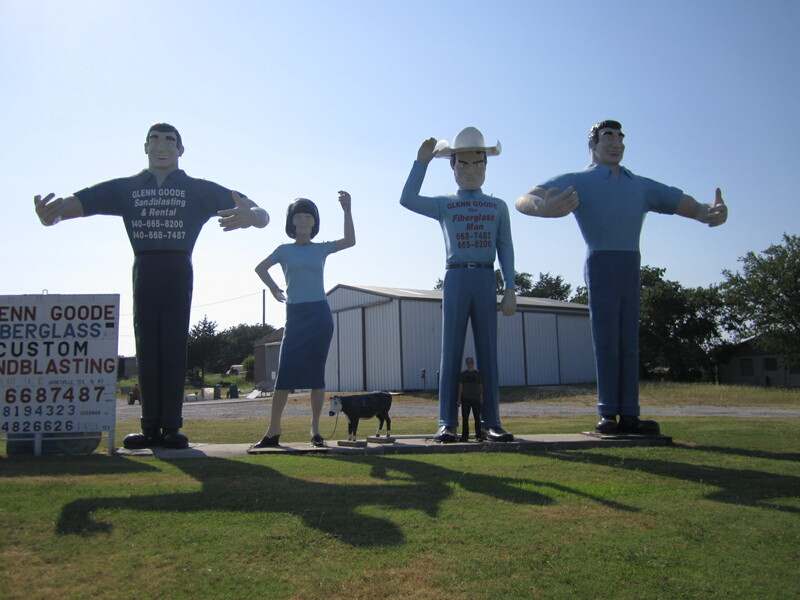 A standard head and cowboy hat was borrowed from a muffler man in Canton, TX and Glen cast a mould from it. 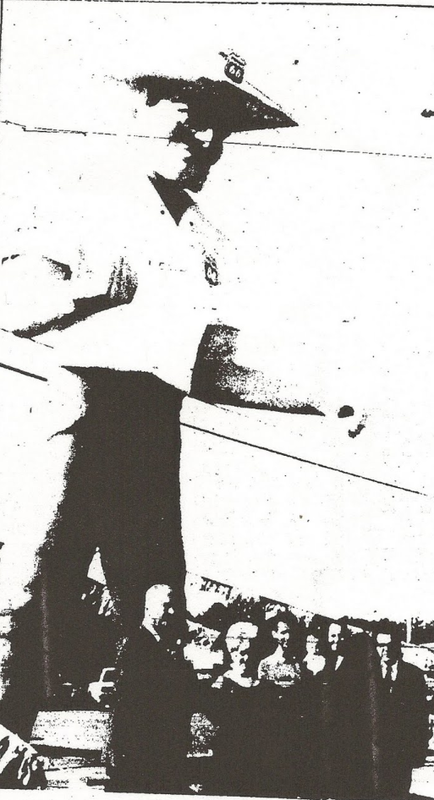 He then talked to Ken Johnson of “Ken’s Mufflers” in Dallas and borrowed the arms from one of his half wits to make moulds for the missing hands. 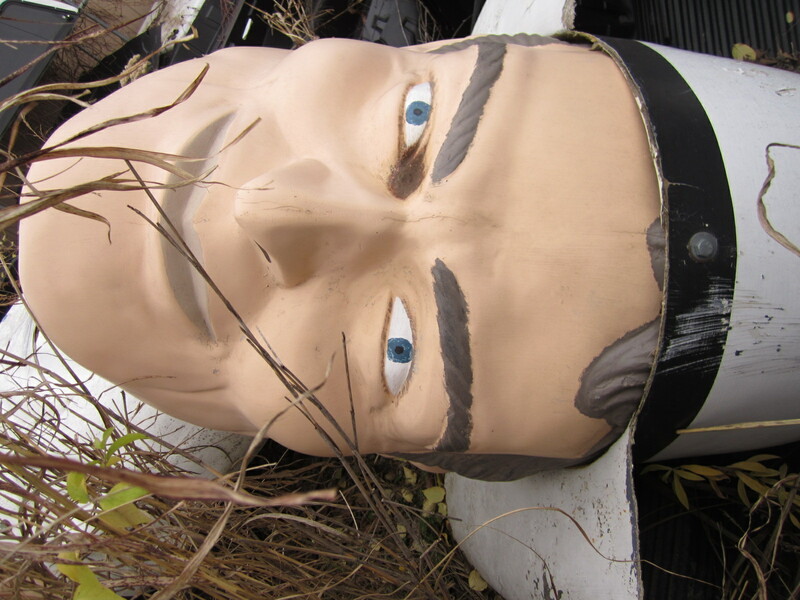 If you look close you will notice that the hands are a dead match for any other standard muffler man as well as the head and face. 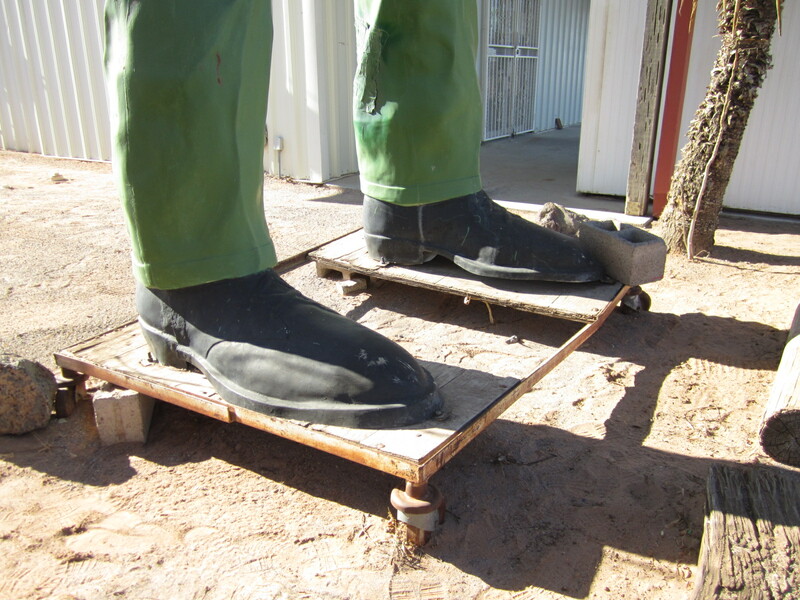 Glen went on to also cast a mould of the body and legs and started making copies so his son could also have a giant at his sandblasting shop in Sherman, TX. 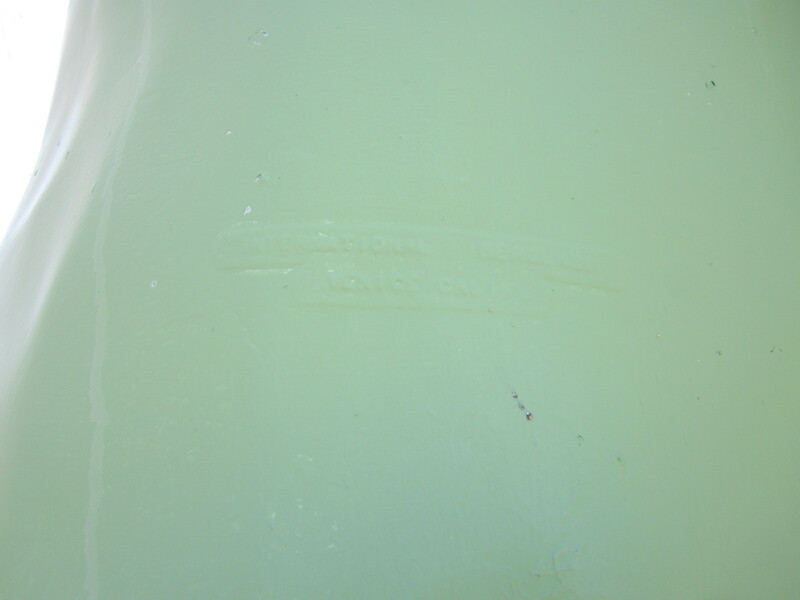 In total he cast two copies from his mould, one still stands in Sherman and the other is up in Amarillo. The moulds still stand in his barn and although they aren’t used anymore it is a rare site to see a mould for this version of muffler men. 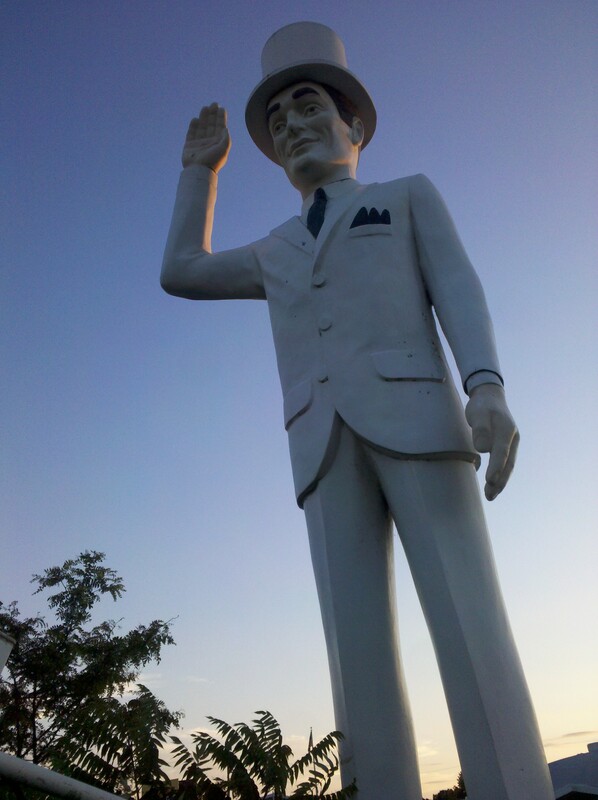 There are a few originals of this kind of M Man still standing but they are rare. 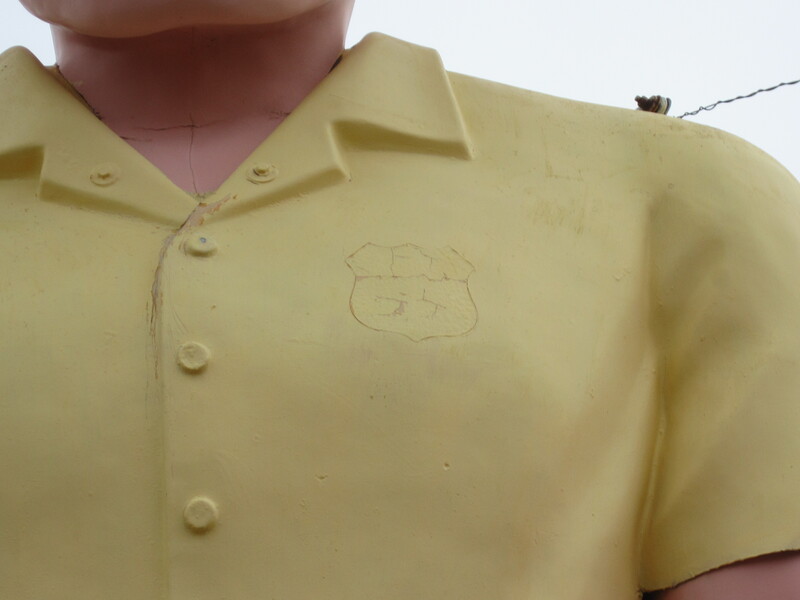 There is one in Oakwood Village, OH that I mentioned in my last blog as well as my #72 sighting (not standing) which is a good example of what the original face and hands looked like. Another exmple of this version but with a suit coat that came as an option for it is in Chicopee, MA. These are great examples of what Glen’s Cowboy once looked like and somewhere out there is a head and hands without a body. So the truth be told, Glen’s cowboy is not really a cowboy at all. 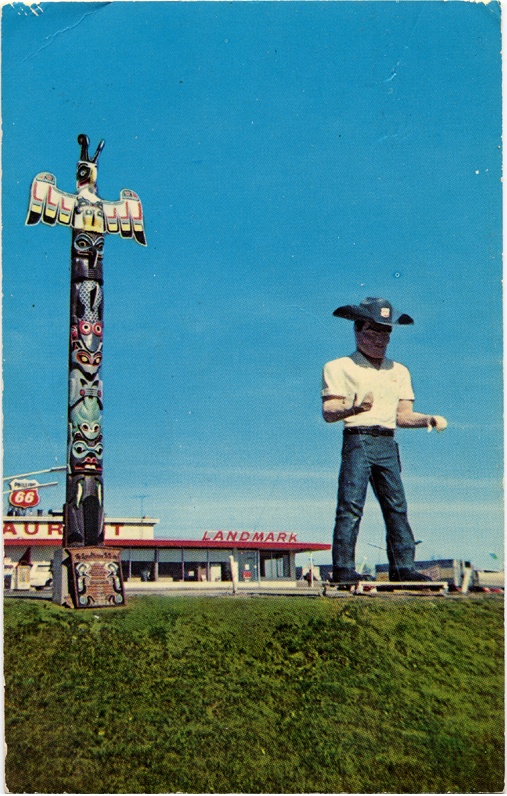 Also as a side note and another mystery I want to track down is the muffler man he cast the head and cowboy hat from. 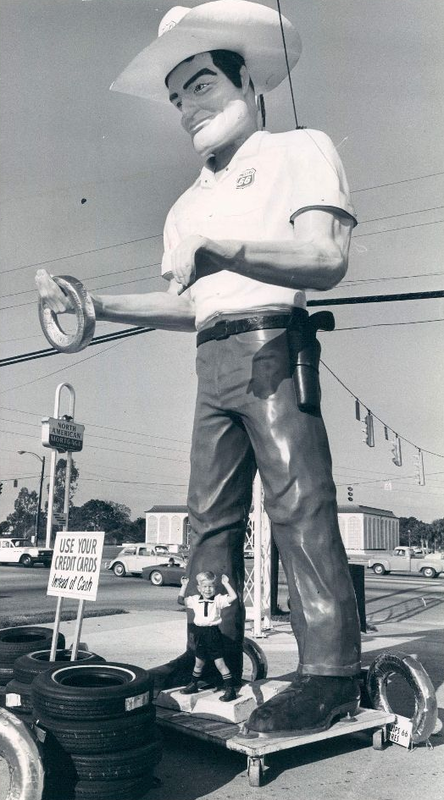 It stood in Canton TX but I’ve never seen a picture of it or learned where it went. If you have any ideas or info let me know.